Harry Dresden is a highly respected (if impoverished) wizard among the supernatural scene, and when a Vatican priest calls on him to help find the stolen Shroud of Turin, he is thrilled to take the job and the fee that goes with it. He is less thrilled to learn that horribly mutilated bodies and hit men are turning up in the investigation, and that Chicago crime-boss Marcone seems to be in the thick of it. At the same time, a top noble of the Red Court of Vampires has just challenged Dresden to a duel, supposedly to placate elements of the Red Court who are waging war on the White Council of Wizards following Dresden’s anti-Red Court escapades in a previous novel. The reasoning is that Count Ortega will kill Harry, the war will end, and thousands of lives will be saved. Harry, faced with the massacre of friends and family should be refuse, accepts the challenge but has little hope of defeating the centuries-old vampire warlord. Enter The Archive, a cute little girl child who is a repository of all human knowledge, has a very scary bodyguard, and who promises to personally kill Dresden if he backs out. And she’s on his side! Back on the streets pursuing the Shroud and awaiting the duel, Harry encounters some very scary demons whose master is determined to capture Harry’s soul. Fortunately, he is rescued by three Holy Warriors, including his good friend Michael Carpenter, who recognize fallen angels hidden inside the demons and prepare to do battle. Toss in the arrival in Chicago of Susan Rodriguez, Harry’s half-vampire former girlfriend and lady love who has been living in Peru for the past year, White Court vampire Thomas who seconds Ortega in the duel but seems to favor Harry, along with a host of old favorites like coroner Butters, medium Mortimer, cop Murphy, and Bob the Skull, and you’ve got the makings of a rollicking good time. 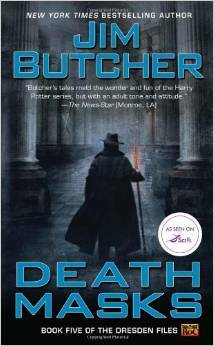 Butcher is up to his usual hijinks, with his irreverent humor, his strong characters, his non-stop action, and his poignant moments where we are introduced to new aspects of Harry’s history, and even another side to scary gangster Marcone. Death Masks is a winner. Share the post "Wizard Harry Dresden in fine form in Death Masks"